The Jury.Online platform is an Investor-Project environment for a secure multistep release of the funds and the tokens to the parties with an escrow and third-party arbitration option. This is a standard setting protocol of the future of the ICO. Jury.Online strives to ensure a new environment for the future of ICOs, making them responsible to deliver their ideas into viable projects by securing investor funds on a decentralized escrow smart contract published by the project. The release of the funds and tokens may be activated only by initiation of each stage of the product’s development or by third-party decision of the arbiters linked to the smart contract. Jury.Online has released v.1.0 of the platform together with demo version in Ropsten testnet. Jury.Online is supervised and supported by Krypton Capital, which has dozens of projects in its portfolio. Paxtradings: For those who are not familiar with Jury.Online, can you explain what it is and what the team aims to accomplish? Shevtsov: The Jury.Online platform is an Investor-Project environment for a secure multistep release of the funds and the tokens to the parties with an escrow and third-party arbitration option. This is a standard setting protocol of the future of the ICO. Jury.Online strives to ensure a new environment for the future of ICOs, making them responsible to deliver their ideas into viable projects by securing investor funds on a decentralized escrow smart contract published by the project. The release of the funds and tokens may be activated only by initiation of each stage of the product’s development or by third-party decision of the arbiters linked to the smart contract. Prudnikov: Jury.Online has released v.1.0 of the platform together with demo version in Ropsten testnet. Jury.Online is supervised and supported by Krypton Capital, which has dozens of projects in its portfolio. Paxtradings: How does the Jury.Online token (JOT) function within the platform and why is it needed? Shevtsov: Currently the protocol is built on the Ethereum platform, which allows it to be used in any transaction on this platform. This means that any company can implement it into their own platform. To use the Jury.Online platform directly, the investor and the project pay a commission from the amount of funds deposited on the smart contract (the amount of the proposed investment). At various stages of platform development, the total commission will vary from 1% to 7%. Prudnikov: An important circumstance is the fact that the commission is paid by both parties — thereby we not only share the financial costs and responsibilities between the parties, but also declare our non-affiliation to one of the parties. While the platform grows and develops, all our clients will have some sort of cashback in JOTs — from every paid fee they will have 33% cashback in JOTs. They are free to sell it on the free market or use it as a currency of payment for Jury.Online services in the future. Mostly, if clients pay for services in JOT, it will cost less, comparing with the situation when services are fully paid in ETH. Arbiters fees also can be paid in JOTs. So, we see JOT as an important part of the Jury.Online ecosystem with huge potential to be demanded on market. Paxtradings: How do escrow and multistep funds release process function on the Jury.Online platform? Shevtsov: Stored funds are released upon completion of certain milestones set by the project. Roadmaps of the milestones may be linear or complex based on the planning and prediction of the project. Jury.Online provides its users with all necessary tools to implement smart contract’s funds release depending on the roadmaps of the project. Funds are stored on a smart contract balance and can’t be released unless the certain conditions and requirements are met. Paxtradings: How does ICO dispute resolution work within Jury.Online ecosystem? Prudnikov: Jury.Online offers pools of arbiters for the projects and investors. Arbiters are people well-known in various areas such as IT, fintech, legal, or blockchain and they are not affiliated with either of the parties in the platform. They make preliminary evaluation of the project, give advice in their area of specialization and, in case of conflict, analyze the results and vote for either of parties. Paxtradings: Security and transparency is one of the biggest topics for ICOs. What kind of security measures is Jury.Online offering? Shevtsov: All smart contracts are deployed by the projects, but they are based on Jury.Online templates which are open source and verified. This method helps to achieve flawless operation of smart contracts and add arbiters to the relations between the investor and the project. Blockchain provides the parties with the unique security measures to keep their communication and funds safe. Paxtradings: Who can register to become an arbiter? When can you appeal to arbiters? How do the arbiters make decisions? Prudnikov: Arbiters are public people, experts in various fields, including law, fintech, IT, who make a decision in the case of a dispute to continue the work of the project or return money to investors. It is enough to make an application on our site. The application is moderated, and if you are fit, wait for a confirmation email. All the arbiters who have passed the moderation will appear on our site in the arbitrators section. It is possible to appeal to arbiters in three days period after the completion of the road map. At the time of appealing to the arbiters, indicate the reasons for appealing, which will help to understand the situation quicker. 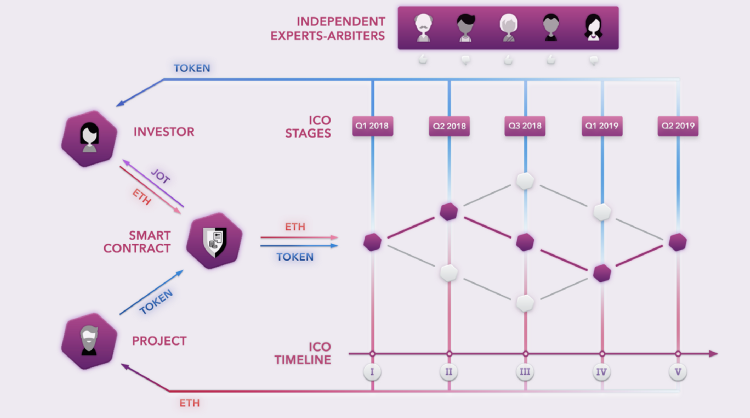 Within three days period after appealing to the arbiters, they are obliged to accept the dispute for consideration, analyze the results of the project, compare them with those set out in the roadmap and based on it decide in favor of one of the parties. They can ask questions to both sides together, or individually, to get the necessary information. Paxtradings: How will the arbiters market function? How are they incentivized? Can you please describe the marketplace and the features it offers? Prudnikov: Growing and expanding Jury.Online will form an arbiter market by providing arbiters with rating and allowing them to set their own pricing for ICO supervision. The parties of the platform will have the opportunity to choose from the list of the arbiters based on their rating, price or specialization, knowing costs in advance. Shevtsov: Each arbiter, regardless of the existence of a dispute, receives a percentage of the investment amount in the JOT equivalent at the weighted average market rate. Afterwards, in the presence of a good rating, which will be awarded to each of the arbiters, he will be able to set the price of his arbitration. Paxtradings: What projects can register on the Jury.Online platform? What is necessary to register the project on your platform? Prudnikov: Any project that is ready for a responsible holding ICO can register on the Jury.Online platform. After filling in the basic information, the application passes the moderation stage and then appears in the general list of projects. In the future, the separation into open and closed parts will be provided. Access for investors to the closed part of the project will be carried out by a specially generated link, which the project transfers. Shevtsov: First of all, it is necessary to show investors that the project is ready to bear certain risks and approaches responsibly to the full implementation of the project. If you have such desire, you need to register, providing a link to the site, the company name, basic information about the team, ICO information and a detailed roadmap. Shevtsov: We already have a working platform and are now testing a wide range of scenarios on it. We have already contracted with two clients, who are close to starting their ICOs. Now we are concentrated on a successful ICO which lasts until April 30, depending on the results. Prudnikov: But talking about concrete steps I can divide our plans into two groups — technical and commercial. We plan to integrate a number of features like implementation of funds distribution in linear milestones system according to the weights of the milestones’ goals with manual and automatic customization. It will make use of our platform much more variable and I’m sure our clients will appreciate it a lot. Investors and projects will have the possibility to adjust the weights in funding and token distribution to customize personal invest contracts. This will require a significant rebuild of existing smart contracts. UI and UX platform design and implementation of the project, Arbiter, investor profiles and project marketplace. Commercial aspects of our plans are connected with building strong sales and account teams who will provide Jury.Online with a huge amount clients and outstanding service to our clients. The second important topic is JOT’s listing on a number of leading exchanges. We are already actively working on it. The main ICO began on November 13, 2017 and ended on December 13, 2017. There was a limit of 30% of total tokens (6,300,000 JOT). Tokens can be purchased using ETH, BTC, LTC, ETC, BCH. The main ICO began on February 14, 2018 and will end on April 30, 2018. There are a total of 14,700,000 Jury.Online tokens (JOT) available during the main ICO, representing 49% of the total JOT supply. A hard cap of $6,000,000 is set for this period. Current accepted currencies for Jury.Online include ETH, BTC, LTC, ETC, BCH. Jury.Online is an ERC20 token, so it’s important that contributors use ERC20 compatible wallets to send funds to the ICO smart contract, and to receive the Jury.Online tokens. Choose your currency and enter your wallet details. There are a total of 30,000,000 JOT tokens available to be created, with 21,000,000 JOT available across the pre-ICO and ICO and up to 9,000,000 JOT will be reserved for Jury.Online. Contributors will have their tokens distributed shortly after the end of the ICO. Visit the Jury.Online website for more information and the contribution address. View the Jury.Online website here.